We believe that you deserve and have the right to products with only the purest ingredients, without fillers, where every ingredient counts toward reaching your goal. We have partnered with the leading manufacturer of natural formulas and we have the final word on what goes into each of our products. Our mission is to make sure you are on the healthiest and most effective path to your goal. We take supporting you on your journey very seriously. Each of our support staff goes through an intense and ongiong training program to learn every aspect of the weight loss formulas and programs we offer. Then, as Weight Loss Consultants, they are required to become a Certified Nutrition Coach through Venice Nutrition, which offers the most advanced nutrition certification available in the country. Our coaches continue their studies and complete a new certification every two years, including the most popular choice: Certified Food Psychology Coach. Why is this important to YOU? First, this is unprecendented in our industry. You cannot get this level of care, support, and knowledge anywhere else. Second, you have the peace of mind of knowing that when we give you nutrition advice and plans, both for weight loss and weight stabilization, they are based on professional knowledge and experience. Once you order a weight loss plan from us, you have the benefit of our professional support for life. FREE. If you want to take weight loss support a step further, you can also choose private coaching (wellness, nutrition, food psychology, etc. ), which is available for a comparatively low fee. Our coaches are here for you five days a week from 10:00 a.m. to 5:00 p.m., Monday through Thursday and 10:00 a.m. to 4:00 p.m. Friday, Eastern Time. Choose from a variety of ways to contact us: Toll-Free Phone, Email, Website Contact Form, Live Chat, Facebook, or visit our retail store in Acworth, Georgia (northwest Atlanta). We know you want to start losing weight NOW! That's why we ship your order the same day if placed before 4:00 ET Monday through Friday. Shipping to U.S. locations via USPS Priority Mail is free on orders of $100 or more. ThinNow is one of the only companies who can successfully ship HCG and other hard-to-get weight loss formulas to Canada and abroad. I endorse the ThinNow diet plans, which focus on nutrition and are the key to their clients' weight loss results. 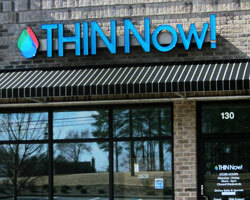 If you are in the Atlanta or Acworth area, please stop by our store!